It’s the second year I am teaching the HUM-401 class at EPFL with Daniel Sciboz. The course is about creative processes and tricks employed by designers in their work. Our aim is to show engineers from various areas (IT, biology, chemistry, material sciences, architecture) a different approach than the one they have through various means: short lectures, basic assignments and crits. The first semester is devoted to techniques and methods, and the second semester corresponds to a personal project. This course is extremely refreshing for me as it allows to understand the various frictions between “designerly” of doing. I blogged about this last year here and this new class will have will certainly lead me to new findings. We discuss what we found in the field study conducted at the beginning of the semester, and highlight the categories of findings: problems (pain points, lack of something, bad functionality), expressed or observed needs, constraints (physical, social, cultural), general interaction principles, existing solutions, weird ideas. These findings are presented as starting points for “creating something”. Then we discuss the importance of using tangible material to “test” ideas. The funny part of the discussion here, with engineers, is to make them understand that there is no “silver bullet” and the importance of iterating. I introduce here the notion of “thinging” (Pelle Ehn), the practice of using rough things to decide collectively where to go. 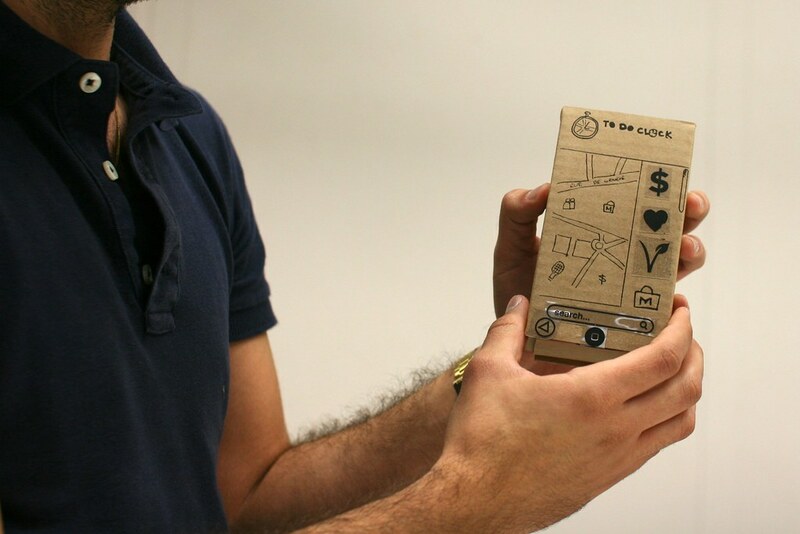 Mock-ups or props can be seen as “experience prototypes”, to “understand, explore or communicate what it might be like to engage with the product, space or system we are designing” (J.F. Suri). 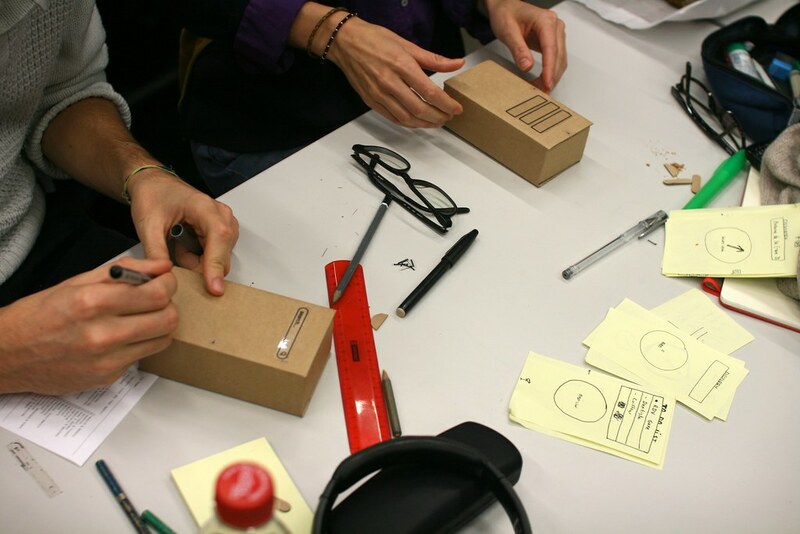 The idea that mock-ups to test things not only in talk but also through richer bodily, social and contextualized interactions, is easily grasped by the students but not necessary easy to put in place. This is why we then apply these ideas with two exercises. That brief is straight-forward the the exercise went well. It’s always hard to have the students role-playing the presentation. Most have the tendency to do a demo (it may be more natural with such an audience) and not to show a real-interaction. Context of use: find new places to visit and spatially organize your day. What it does: the app allows to create “to do lists” by dragging icons of tasks to a map of the city you are at. 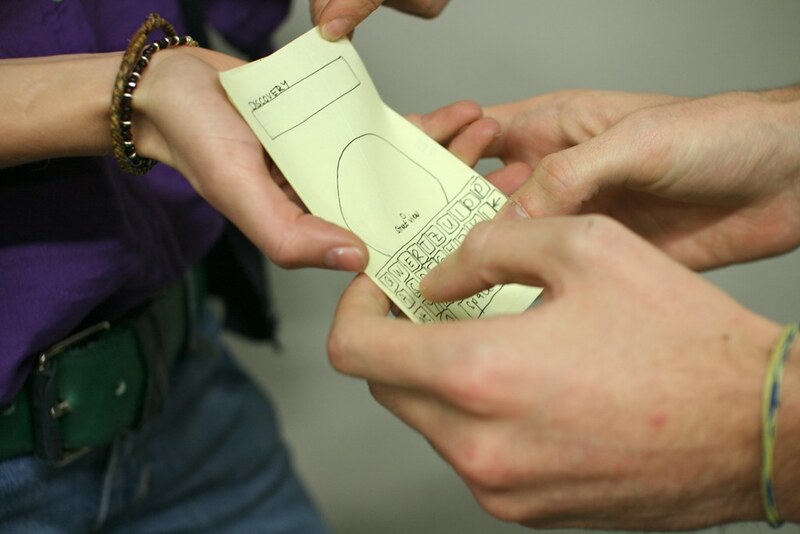 The user gets points if he/she gets on time to every places where a todo item is located. What it does: a location-based game with a map of where the user is. 3 game modes: survival, capture the flag, and run. What it does: the service allows to locate you on a map (as well as POIs) by scanning the skyline of the city in which you are located. The fact that we had both exercises was a good thing, it allowed to have a final discussion about the relative merits of the two, and the importance of using different types of material to iterate and test ideas in different directions. 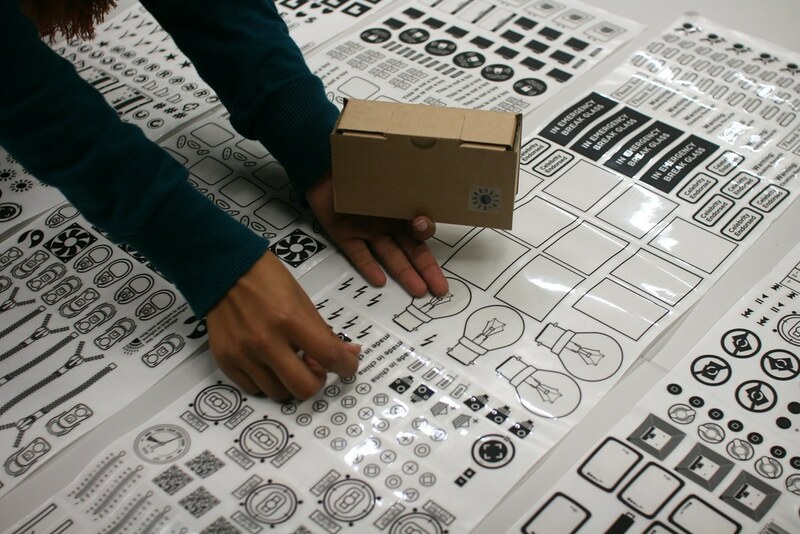 The tools themselves lead to intriguing ideas, sometimes in a divergent way (new features enabled by tons of stickers! 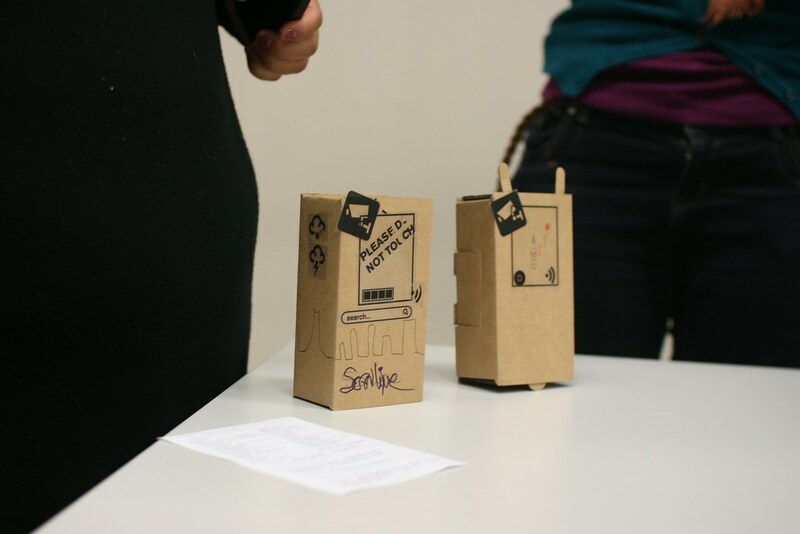 ), or by narrowing down the possibilities (the form factor of the cardboard boxes in the second exercise leads to lots of smartphone app ideas). 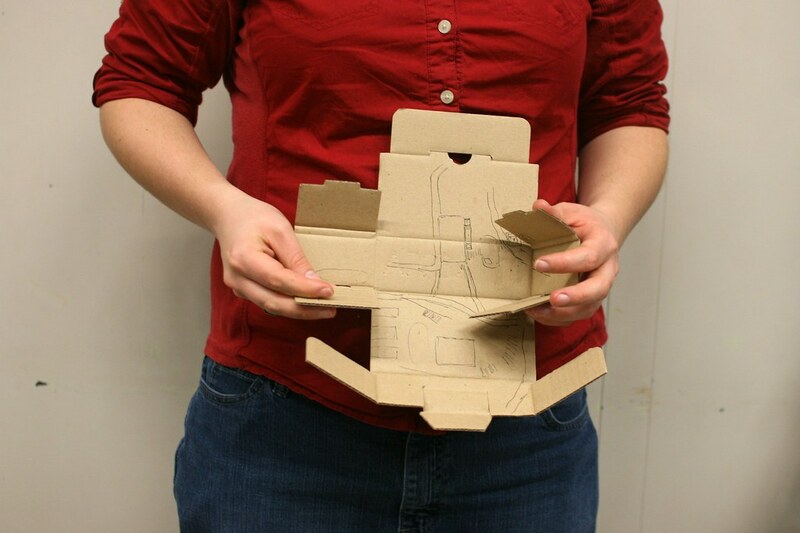 Only two students (out of 16) realized they could use the cardboard box as a sort of foldable device! As usual with such kind of assignments with non-designers, there is a tendency to treat it as fun and almost absurd. This leads to participants using weird post-its or thinking about odd features for the sake of it. This is of course problematic but I think it’s a starting point for a discussion about the difference between having fun creating something (targeted to a certain user) and not making weird choices because it’s simply funny. Why do I blog this? Debriefing the use of new tools is interesting for upcoming workshops. Yuzawa Yeah. We were sure to make use of that. 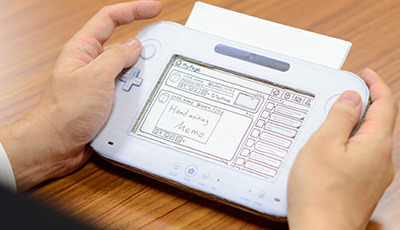 And when the Wii U GamePad controller still hadn’t come together, we had Motoyama-san make a mockup (model) so we could check how it would feel in your hands. Motoyama I actually brought that today. I’m sorry it’s such a shabby thing. 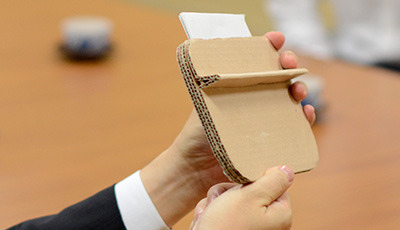 Iwata Oh, it’s made out of cardboard! (laughs) Motoyama Yeah. The screen has a lid and you can insert pieces of paper in the top to change the display. Motoyama We wouldn’t know how it felt unless we could actually hold it, but since we didn’t have one, the only thing to do was make one. In the middle of the night, I cut pieces of cardboard and glued them together. Motoyama Well, it didn’t make that much of a difference. (laughs) Kurisu Yeah. 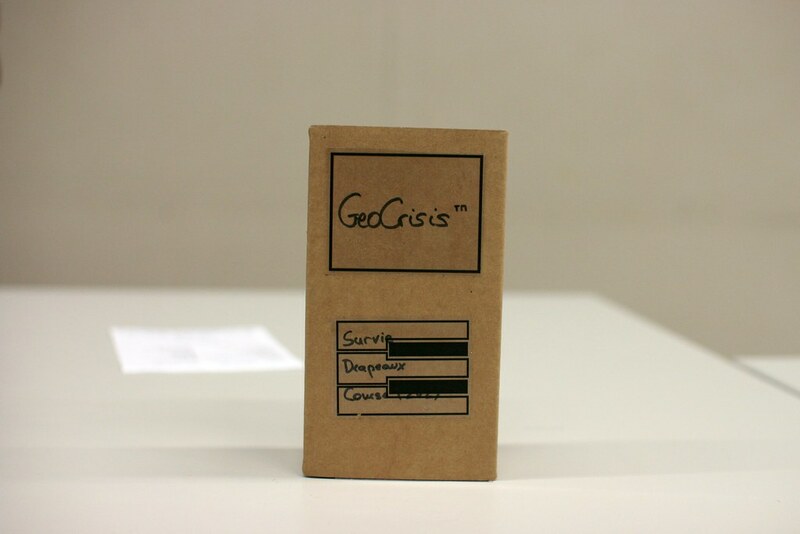 (laughs) But having a mockup like this that you could hold helped us get a better idea of what was being made. A familiar challenge is to translate the seemingly unyielding demand to put a specific technology into something because it is expected, or because the name of the technology is the new great thing. It doesn’t matter what it is in particular — I use “doorknob” as a stand-in for whatever the latest “doorknob” of the day might be. For example — we’re going through an Augmented Reality “doorknob” phase presently, as most of you know. 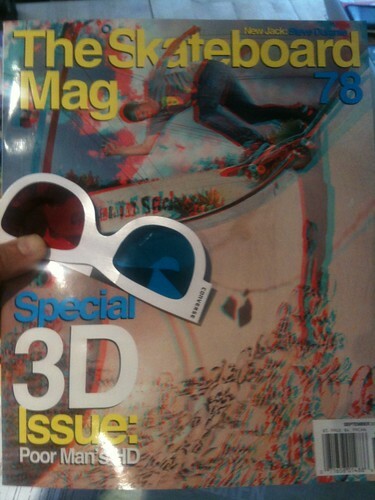 As evidenced by the recent issue of “The Skateboard Mag (78)”, we’re also continuing to go through another, another 3D “doorknob” phase. Which is fine, I guess. 3D is fun when the impact is light, like a magazine. What do I mean by doorknob? Doorknobs are things that rarely mean anything at all to normal human beings but they mean everything in the world to doorknob enthusiasts who spend most of their time trying to put doorknobs onto everything they possibly can — coffee tables, lampposts, patio chaises, kid’s t-shirts, wrist watches, fancy cameras, car dashboards, toasters, clock radios, keychains, tea kettles, baseball hats.. I could go on, but I’ll let the “doorknob” enthusiasts go crazy themselves. Rarely, on occasion — someone puts a doorknob on a door because, perhaps, they lead their thinking and ideas and making with principles that focus on people and their practices before they just think of shoving doorknobs on kitten collars or broom handles. Rather than specifying design first based on technology and engineering-based *parts, fashion small, short stories around the people-based principles that might, in the end, specify that a doorknob be used. But, only at the tail end of things. If you start to feel like you’re bolting doorknobs onto stuff cause some guy in a yellow tie and blue shirt had a graph that suggests that competition is going to start using Baroque, mother-of-pearl encrusted doorknobs on their 2013 saw horses — then obviously something is backwards with the design process. Increasingly — or maybe at this point completely — my own opinion is that, for the near future at least, design can play a much larger role in fashioning and specifying and coordinating the activities between all the other participants in the making of things. Amongst engineering, marketing, operations, production, sourcing and so on. Not that all that is fun at all — but it may be crucial and necessary for creating a legible, sensible “output” at the end of a lot of hard work. Something that communicates and represents value in a people-centered way. It’s incredible how much kruft comes out at the end of markets-led decisions — it’s simply unsustainable, and often done just to keep a foot in the door and so that conversations (good or bad) continue to float around. Okay. Back to it, then.